Follow the largest and most accurate FIFA 19 TOTS predictions if you want to know who will make part of every single Team of the Season. Find out the most informed players of the main leagues, including Premier League, La Liga, Bundesliga, Serie A, Ligue 1 and Ultimate TOTS. Who has chances to take part of the FIFA 19 Premier League Team of the Season? FIFA 19 TOTS inform cards of the Premier League are awarded in FUT 19 for consistently good performances over the course of the football season in England. The FIFA 19 Premier League Team of the Season will be decided by EA SPORTS and will be available for one week, with a predicted release date of around May 17, 2019. These blue items will receive significant stat upgrades, and will sell for a lot more FUT coins than regular informs. Let’s check our FIFA 19 TOTS predictions for this league. Who has chances to take part of the FIFA 19 La Liga Team of the Season? 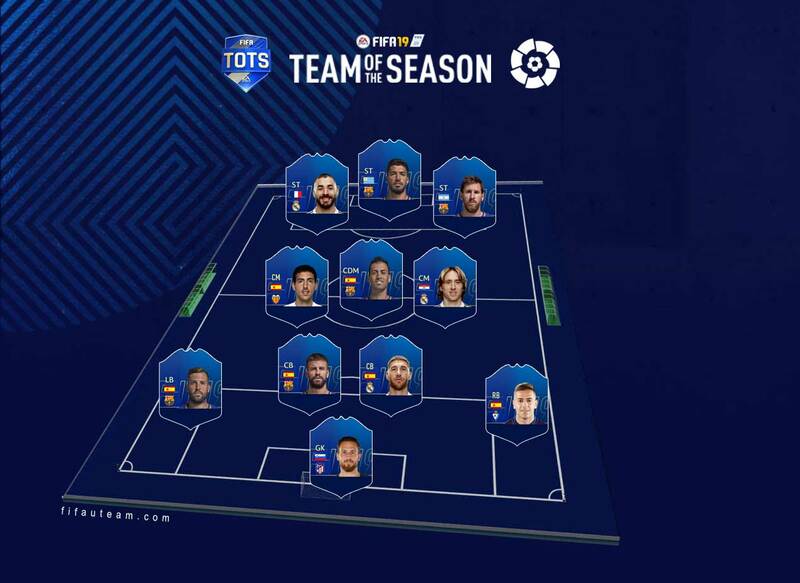 FIFA 19 TOTS inform cards of LaLiga are awarded in FUT 19 for consistently good performances over the course of the football season in Spain. The FIFA 19 La Liga Team of the Season will be decided by EA SPORTS and will be available for one week, with a predicted release date of around May 24, 2019. These blue items will receive significant stat upgrades, and will sell for a lot more FUT coins than regular informs. Let’s check our FIFA 19 TOTS predictions for this league. Who has chances to take part of the FIFA 19 Bundesliga Team of the Season? 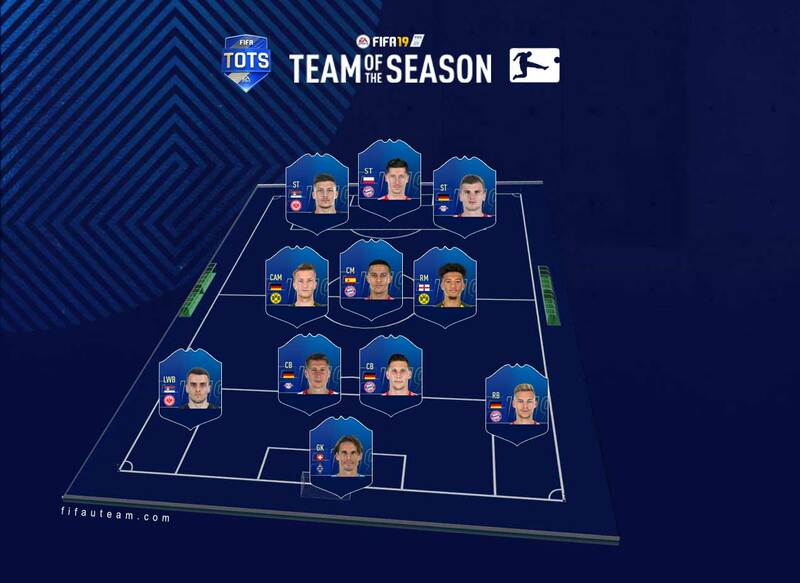 FIFA 19 TOTS inform cards of Bundesliga are awarded in FUT 19 for consistently good performances over the course of the football season in Germany. The FIFA 19 Bundesliga Team of the Season will be decided by EA SPORTS and will be available for one week, with a predicted release date of around May 31, 2019. These blue items will receive significant stat upgrades, and will sell for a lot more FUT coins than regular informs. Let’s check our FIFA 19 TOTS predictions for this league. Who has chances to take part of the FIFA 19 Serie A Team of the Season? 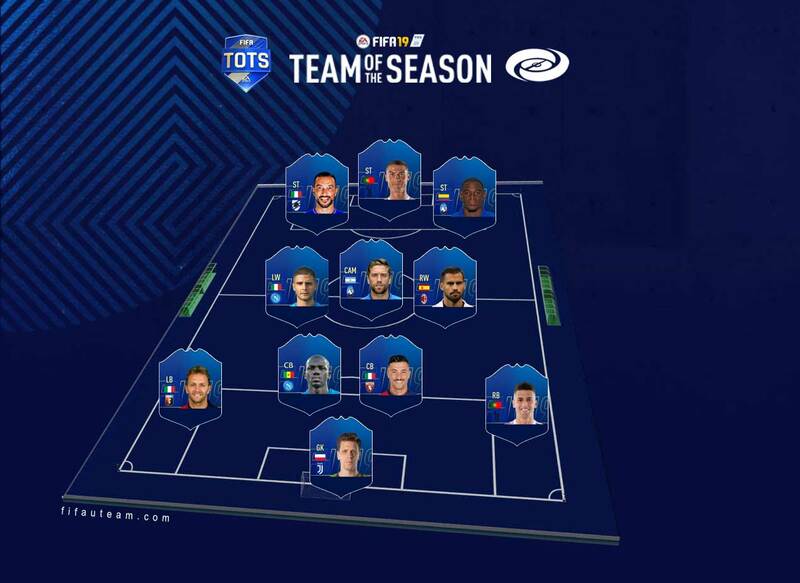 FIFA 19 TOTS inform cards of Serie A are awarded in FUT 19 for consistently good performances over the course of the football season in Italy. The FIFA 19 Serie A Team of the Season will be decided by EA SPORTS and will be available for one week, with a predicted release date of around June 7, 2019. These blue items will receive significant stat upgrades, and will sell for a lot more FUT coins than regular informs. Let’s check our FIFA 19 TOTS predictions for this league. Who has chances to take part of the FIFA 19 Ligue 1 Team of the Season? FIFA 19 TOTS inform cards of Ligue 1 are awarded in FUT 19 for consistently good performances over the course of the football season in France. The FIFA 19 Ligue 1 Team of the Season will be decided by EA SPORTS and will be available for one week, with a predicted release date of around June 7, 2019. These blue items will receive significant stat upgrades, and will sell for a lot more FUT coins than regular informs. Let’s check our FIFA 19 TOTS predictions for this league. Who has chances to take part of the FIFA 19 Football League Team of the Season? FIFA 19 TOTS inform cards of the Football League are awarded in FUT 19 for consistently good performances over the course of the football season in the English lower leagues. 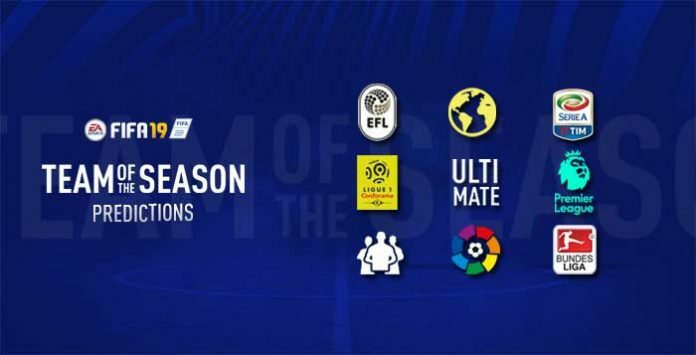 The FIFA 19 Football League Team of the Season will be decided by EA SPORTS and will be available for one week, with a predicted release date of around May 10, 2019. These blue items will receive significant stat upgrades, and will sell for a lot more FUT coins than regular informs. Let’s check our FIFA 19 TOTS predictions for this league. Who has chances to take part of the FIFA 19 Rest of the World Team of the Season? FIFA 19 TOTS inform cards of the ROTW are awarded in FUT 19 for consistently good performances over the course of the football season in the leagues not covered by the previous TOTS. The FIFA 19 ROTW Team of the Season will be decided by EA SPORTS and will be available along the event, with a predicted release date of around May 10, 2019. These blue items will receive significant stat upgrades, and will sell for a lot more FUT coins than regular informs. Let’s check our FIFA 19 TOTS predictions for these leagues. Who has chances to take part of the GFIFA 19 Communnity Team of the Season? FIFA 19 TOTS inform cards of this squad are awarded to players for consistently good performances over the course of the football season, who never had the luck of getting an IF card. The FIFA 19 Most Consistent Team of the Season will be decided by the FIFA Community and will be available for one week, with a predicted release date of around May 10, 2019. These blue items will receive significant stat upgrades, and will sell for a lot more FUT coins than regular informs. Let’s check this FIFA 19 TOTS prediction. Who has chances to take part of the FIFA 19 Ultimate Team of the Season? FIFA 19 TOTS inform cards of EAS are awarded in FUT 19 for consistently good performances over the course of the football season according to FIFA Dev team opinion. The FIFA 19 EAS Team of the Season will be decided by EA SPORTS and will be available for one week, with a predicted release date of around 21 June, 2019. These blue items will receive significant stat upgrades, and will sell for a lot more FUT coins than regular informs. Let’s check this FIFA 19 TOTS prediction. ⚠️ The players are sorted by positions (GK; RB, RWB, CB, LB, LWB; CDM, RM, RW, CM, CAM, LM, LW; CF, ST) and by overall rating. 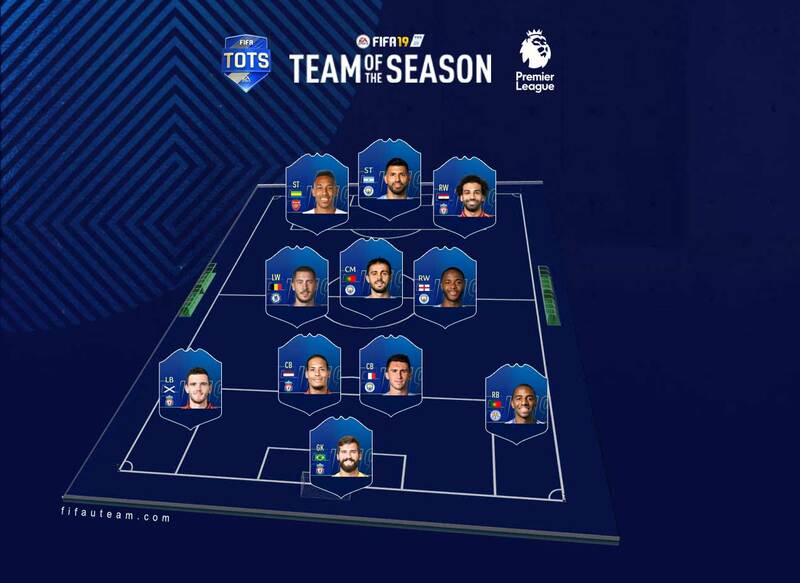 ⚠️ The TOTS published on this page are only predictions. Will ones to watch be affected by these upgrades? Ligue 1 image is wrong. it currently has the bundesliga squad image. Thank you. We have fixed it now. How can u give Ronaldo a 99 but not mbappe??? Until now, no one got a TOTS cards with a higher rating than his TOTY card. That’s why Mbappe ‘only’ has 97. Yes, it already happened one or two times but it is very rare. It is the exception. Milik is from Poland not from Italy. Thank you for pointing it to us.